Everyone's favorite holiday green bean recipe. Anyone who cooks, and everyone who has ever eaten a Thanksgiving dinner is familiar with that old favorite the green bean casserole. 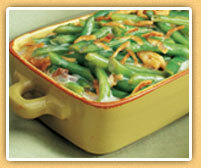 What could be more simple, frozen or canned green beans, cream of mushroom soup and canned dried onions. Just try to find canned dried onions within three days of Thanksgiving in any foodstore - good luck. Campbell's came up with this creamy/crunchy concoction in 1955 and estimate that 20 million of these casseroles are served each year, so buy your ingredients early. I just saw a version of this casserole that adds drained chopped pimento. Sounds like something to try this Thanksgiving. For those of you interested in a green bean casserole that's considered healthier and definitely more goumet try this Cook's Illustrated green bean casserole recipe that uses fresh green beans, mushrooms and a homemade white sauce. For a change of pace, substitute 4 cups cooked broccoli flowerets for the green beans. For a creative twist, stir in 1/2 cup shredded Cheddar cheese with soup. Omit soy sauce. Sprinkle with 1/4 cup additional Cheddar cheese when adding the remaining onions. For a festive touch, stir in 1/4 cup chopped red pepper with soup.